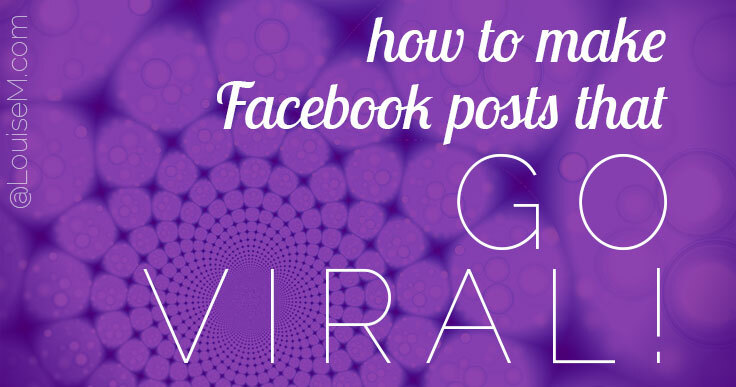 How to Get Facebook Shares that Go Viral! You are here: Home / Facebook Tips / How to Get Facebook Shares that Go Viral! Want to boost your Fan Page visibility? Likes and comments are great, but the most valuable interaction you can get on Facebook is a share. 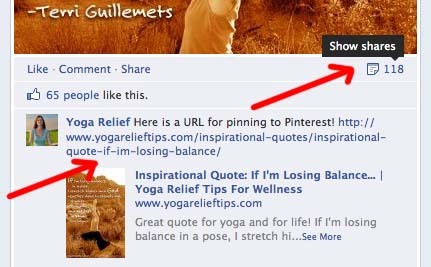 When your Facebook Page post is shared, it appears on the sharer’s Timeline so their friends see it. Now you’ve got a chance of going viral, as shares multiply from friend to friend! Disclosure: This page contains affiliate links to products I’ve used with great success. If you make a purchase through my affiliate link, I’ll receive a referral fee, at no cost to you. Thanks for supporting my free content! 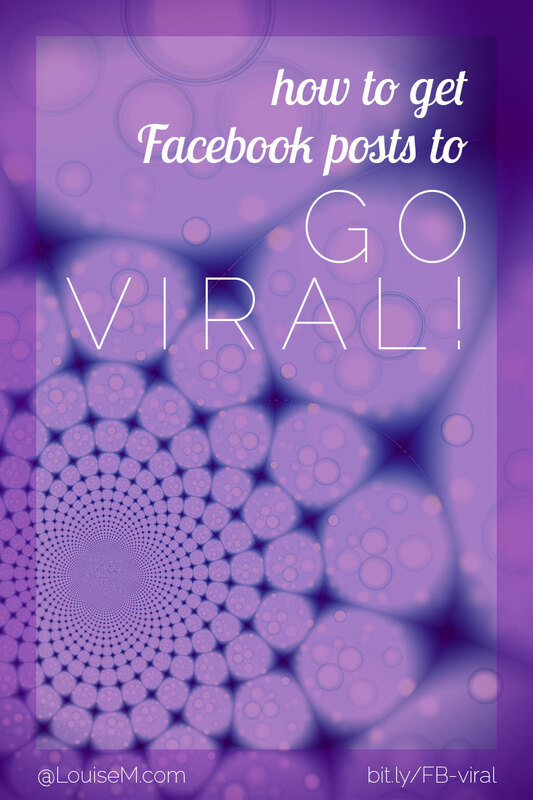 You can get Facebook Shares that go viral! The most-shared Facebook Page content is Photo and Video. Not a photographer? How can you get Facebook shares with photos? Before you decide it’s too expensive or complicated – remember that “Photos” on Facebook means any kind of image. I’ve had terrific results using Stencil to create quote images in seconds. The simple one below was shared by almost 20% of my Fans! 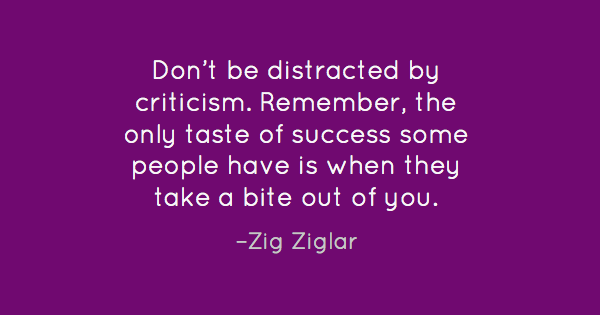 Simple quote graphics can get many Facebook shares. The Pro version of Stencil allows many customizations for a monthly cost under $10US (if paid annually). Or you can use the basic version free! And there are over 100,000 quotes right in the app 🙂 Free photos too! For more quick ways to make picture quotes, read: EASY Ways to Make Picture Quotes. What words should I make into a graphic to go viral? Ask a question your audience would love to answer! This can help you with market research, and boost your reach at the same time. A question made into a graphic is quite powerful for engagement with your audience. Any of my recommended tools can help you make one! However, in most niches, a question is unlikely to get shared and actually go viral. But popular quotes work well! As I noted, there are more than you could ever use in Stencil. 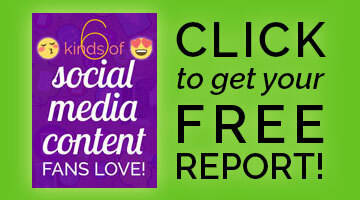 Every day, content is going viral on Facebook – even in your niche! How do you track it down? Post Planner makes it fast and easy to find PROVEN content. Search Post Planner for content by niche, keyword, or your favorite social media accounts. Look for the star ratings to see which posts have been most viral. Hint: Find more 5-star content by expanding the search from week to month. You can easily pick the items that you like best, and schedule them right in Post Planner. Or, use the viral posts to inspire your own unique content. Original content performs best! You can look within the “Quotes” category on the left. Use the viral quotes on your own images. Give it a try and see how it boosts your social media engagement! You can get started for as little as $36 for an entire year. And it’s 100% satisfaction guaranteed. As of June 10, 2018, there’s a special on the GURU plan for $15 monthly when you use the code GURU15. Sign up now! Tag someone for an extra boost on Facebook! If you use one of my recommended tools, you can easily find free photos right in the app. Many free photo sites require you to notify the artists / photographers when you use their work. When using the images on Facebook, this can actually increase your shares! Alert the artist by tagging them in your Facebook post. On some free photo sites, you can also leave a comment with a link showing how you used their image. Do it! If you have the skill to combine a quote and a photo – you’re golden! My favorite design tools make it easy. 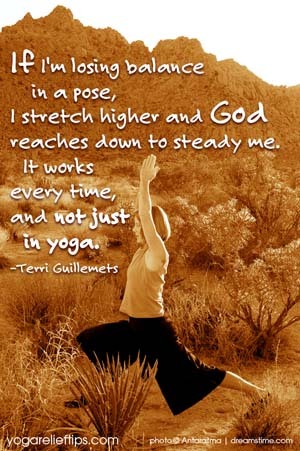 I posted this quote graphic one evening to my Yoga Fan Page, and it was immediately shared to a Fan Page with a huge fan base. Result? In 4 days: a total of 143 shares, visibility to a large audience (5x as large as my Page’s fan base), and – I gained 62 new Fans! The huge thing is I had 693 “People Talking About This” – and I started with only 107 total fans! What a way to increase your Facebook reach. I can’t guarantee you dozens of new Fans, but I do believe the visibility for your Page is worth the effort to make shareable images. Now that you’ve got your shareable image, try these tips to increase the chance of going viral! Share your own Fan Page posts! All shares of shares are now attributed to the original source – so start by posting on your Fan Page to get the visibility. If appropriate, then share from your Page to your personal profile to get your friends involved. Thank sharers! Clicking on the number of shares brings up a window with all Public or friend shares. If available, click Like or comment on their post via your personal profile. If shared by a Page, you can Like and comment as your Page. By increasing their engagement, you’ll help the share get more visibility, and encourage them to share again in the future. You can also upload the image to your website and include the link for people to pin to Pinterest in a comment. But don’t only post graphics and photos. Keep it interesting by mixing in links, videos, questions, and text updates on your Fan Page. This post was originally published on June 7, 2012, and updated on April 5 and June 10, 2018. How about you – what has worked well for you on Facebook? What catches your eye in the News Feed and gets you to share? Comment below. If this has helped you learn how to get Facebook shares that go viral, take your next step! Try Stencil to make your own viral images easily. Try Post Planner to get inspired by or share viral content. as allways, fantastic info here Louise, thanks again! This is such a great post, so full of helpful information, IT should go viral! Thanks so much for your kind comment, Kathy! I’m glad you found the information on how to get Facebook shares helpful. Great post. I would love it if you would to come up with a tuto­rial on how to create quote graphics with pixlr.com and picmonkey.com. Thank you Sharon! I’ll work on that quote graphic tutorial for a future post. I think it will be helpful for many. Yes, i would love to know when you come up with a tuto­rial on how to create quote graphics with pixlr.com and picmonkey.com. How will i know when this has been made available? Hi Louise! Again a great post and info! I am excited to try it all! You are a motivator! Handmade Jewelry News and HJN on FB has the pleasure of more visitors! Wonderful! Best of luck with getting Facebook shares, Crystal! Loving the new huge images in the Facebook news feed. Thanks for stopping by, commenting, and tweeting, Rebekah! Your blogging is getting better and better. this is very helpful for those wanting to improve their reach on facebook. Thank you Rebecca, best of luck with your Facebook efforts! Just discovered your site! I’m now subscribed and looking forward to learning from you! I have been trying to figure out how to make my own quote images/graphics so your post was very helpful. I purchased the ShareasImage pro version but I’m a little confused as to how to use it best. It looks like the only way to share it is to click on the buttons at the bottom of the “post” page. Is this correct? So I can only use it on FB, Twitter, G+, or Pinterest? Can I just cut and paste the graphic into my blog or whatever social media I’m using? And if so, do I copy the image or the URL? Hi Katrina! You can download the image to your hard drive by right-clicking on it! Then you can put it on your website or wherever you want. Have fun! And I would love to see more in-depth tutorials on your site about how to create quote graphics using different site software. Another question, if you don’t mind. I’m still trying to figure out how to use ShareAsImage. When I download the images to my computer (they’re .png files) and then upload to another site (like FB or my blog), the pictures look blurry or of lower quality. FB compresses images to jpegs, so images with flat colors usually end up looking blurry and splotchy. I don’t know why it would look like that on your blog tho. The ShareAsImage at the top of this page looks fine. Unless you’re enlarging them? Or using some blogging system that does the same thing to images as Facebook. Would love the graphics with photos tutorial! Great post! Hey Naj! Thanks for stopping by. Hi Louise, I see so many of these (dare I say trite) quotographics going viral I find it quite astonishing. I’m trying to get the link below to fly with a limited advertising budget – I’ve now got about 1000 shares in all and about 500,000 views but it’s growing steadily rather than rocket powered. I’d be interested to know if you have any suggestions as I’m just a beginner. Unfortunately I couldn’t see the graphic you were referring to. As far as going viral, a lot of it is just timing and luck, and sometimes you just strike a chord with people that gets them sharing. Cute animals and little kids often work, as do snarky sayings. The virality can take off when you get shared by someone with 1000s of friends, or a page with a huge number of fans. I don’t have any specifics on “making” something go viral – wish I did!! Great stuff, did not know there was a generator out there to make such picture quotes thanks. You’re welcome Melanie. Thanks for visiting! So glad to hear it worked for you! You’re welcome. I actually have devised another way that is super easy and works well. I basically open MS Powerpoint and I insert the picture into a new slide. I then open a text box on top of the picture and write the quote. This allows me a lot of flexibility as I can control font, size and color of the text. Once I like what I have, I use a awesome little screen capture utility called jing (http://www.jing.com) and I capture the image and I save it to my hard drive. Now I can upload easily to FB. That’s perfect Steven, I appreciate your sharing that tip. I’m a Mac gal and I rarely use MS products! The web-based editors also allow font control, like Pixlr described in the post linked below. Jing is great too! Is that easier than just saving thru Powerpoint? I guess it avoids resolution issues! Thanks again for sharing your method! I am happy to have found your post . I am going to to try this as i really needs shares for my business. I hope this work as i am not scared to work it hard, and i will let you know if it work. I will also share your post on my wall and twitter account. I hope it helps! Good luck. A very useful read, I found this extremely helpful. I am going to subscribe to your blog and look forward to learning more from you. Thank you for your time and effort. If some Facebook users are unable to share a photo I have posted on my fan page, does this mean their privacy settings need adjusting? Some of my clients can ‘Share’ and some cannot, which does not help my viral campaigns. Thank you again. Chris, I have recently heard from one person that sharing on their Fan Page isn’t working right. Mari Smith was not aware of this issue, so I’m hoping it’s a temporary glitch. If it persists, all I can suggest is to contact Facebook. Sorry! Thank you. I really appreciate the information. I’ve got a fan page for my radio station & we are all looking for ways to increase awareness of our broadcasts. I will put your advice to work today. Terrific! Best of luck to you, Donna. This article is really effective for me. I am grateful to you. Thank you very much. Awesome, I’m glad it was helpful! I just stumbled upon your page through google. Im really new to this Fan page thing, im a photographer and need help to spred my work and more people looking at my work each time. And also gain more likes. Can you please give me some tips?? There’s loads to know and do, much more than can be put in a comment – or even a whole blog! I’ve planned a list of the top Facebook gurus to follow – seeing what others are doing successfully on Facebook is always a good place to start. is sharing quote graphics on facebook and other social sites a good way to get traffic back to your personal website. I have collected quotes over the years and knew that some day they would come in handy. I have several web properties that market different products.. could sharing good quotes that relate be a good way to drive traffic to those sites? for example i have quotes on health and I also sell health related products. do you think this strategy would work? Yes, you can get traffic back to your site via quote graphics, however I believe it’s better thought of as building awareness of your business. On Facebook especially, it’s essential to post things that people want to share, like and comment on – posting links rarely gets much engagement. Due to Facebook Edgerank, you need those highly engaged posts so Facebook will show your link posts to more of your fans. And, the engagement also lets friends of your Fans see your post, become aware of your business, and become a Fan if they wish. Super tips for beginning and intermediate bloggers. Since Facebook started looking down on the ‘like or share’ this, I prefer to use ‘spread the word and help someone.’ I think that works since people want to add value to other people’s lives, as it is added to them.